We have Rust Legacy server hosting prices below for the classic version of the Rust game. As you are most likely aware, servers are massively important now the game has no single player mode. Rust Legacy is the original version of Rust that was on the Unity 4.5 Engine. Release of the game was in 2013 and it only lasted for 2 years until many of the in game features became outdated. Although many players now play on the new version of the game, you can still choose to play Legacy. In fact many players actually prefer to play the older version and it still has an active community. As you can see above loads of hosts still offer Rust Legacy server hosting, due to its continued popularity. To choose the older version of the game you need to enter the steam options and select Legacy. It couldn’t be any easier to switch back and forth. Server hosting for this game is important as you can no longer play this on your own as of 2016. This was because the game was being run by the studio up to this point. Although as mentioned many hosts can actually install Legacy on 3rd party machines. Which will allow you to run the old version, but this saw a drop in popularity. As many people decided to give up on the old version and move over to the newer game for ease. One of the many downfalls to Rust Legacy was the fact that firefights were often easy to spam. One of the hacks was to spam med kits, as they would heal all your health in one go. This would prove to be a problem as any players would be super hard to kill due to spamming. This was not the only problem with combat, as players also said that the bullet trajectory was very predictable. So many skilled players were able to dodge bullets with ease. This made it very frustrating for new players. Which was another problem that was later updated in the new version of the game. Another difference between the two versions was the way in which players built buildings. The main one being the building privilege option. Which only allowed certain players to interact with the building and materials. 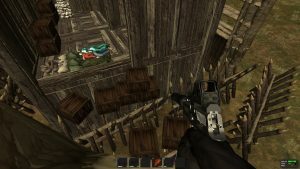 This feature stopped players from raiding bases and people’s loot chests. Though many argue that this feature made the game less realistic. The majority of players were happy with the addition of this feature in the new RUST. Although the original building process was a lot easier than the newer one. But it was less forgiving if you messed up the original build. The new version actually sorted this issue out by adding pre-built blueprints. This allowed newer players to grasp the game quicker without fear of an uncompleted base. The crafting system was also different in this version. As many of the better weapons were available by default. This changed in the newer version making the game harder, as it took more materials and xp to progress. But this was one of the key updates that helped balance the game out and make it more user friendly. 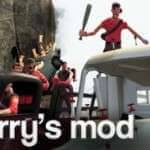 Gmod was the first game created by company Facepunch Studios. With much of Rust’s influences coming from Garry’s Mod it’s a perfect similar game. With tons of game features and building blocks the core game is limitless. Making this the ultimate game for players that have a creative flair. In Garrys Mod you can either choose to start with a completely blank canvas and create your world from the bottom to top. You can access many of the community built mods, items and characters that have all been custom made. The game has a huge focus on modding so why not join this creative community and see what you can dream up. 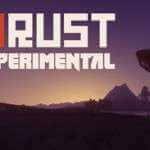 Rust Experimental is the first version of RUST, with many European players actually preferring this version. The game was recently removed from the Steam options. Players can still access this old version if they either have a saved copy of the old files. Or they decide to host via a 3rd party company as many still have the old files. The main difference between the versions, was the game options and many of the game physics. Killing other players in the older version was seen as harder because player were able to use bugs to help them. This included easier healing and much better targeting when shooting enemies in Rust Experimental.